Spectacular, luxury villa with infinity pool, overlooking the sea. Ideal for photo-shoots, TV spots etc. North west. 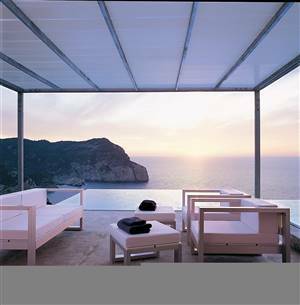 Architectural Design is a spectacular, luxury villa designed by the famous architect Ramon Esteve. Perfect for film, photo shoots or large groups, each double bedroom comes with its own en-suite and either a private terrace or access to the main terrace. The pool is not only great for swimming in, but is a work of art in itself as the bright sky and crystal blue sea below blends in around it. For entertainment, one of the two lounges has its own home cinema . Consult us for daily price for photo shoots etc; the team members/actors/crew can stay at the villa at a special price. The nearest shops and restaurants to the villa are in San Miguel, a beautiful and traditional small Spanish town. For sun, sea and sand, the nearest beach is Port San Miguel or alternatively the infamous Beniras beach is a mere 8km away. A 15km drive takes you straight to the heart of Ibiza Town – perfect for clubs , restaurants, bars, shops and not forgetting a little bit of culture!